Unhealthy Obsession with Cars: Chevy Volt approved for production! Chevy Volt approved for production! I'm somewhat an oddity. I am a hard-core automotive enthusiast - but also incredibly conscious of the ecological impact of my hobby. 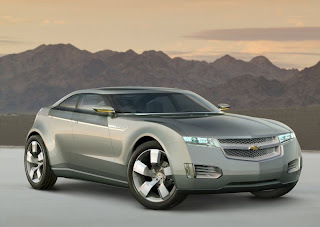 As that, I am seriously stoked about the Chevy Volt concept. If you've been under a rock for the last few months, the Volt was the first implementation of GM's E-Flex concept. In essence, picture the E-Flex (and the Volt) as an electric car. Using cutting edge Li-Ion battery technology (similar to what you'd find in consumer electronics like laptops), the vehicle allows for range of around 40 miles on a charge and the ability to charge in a few hours from standard household current. While 40 miles would not be enough to entice most folks, GM gets around this by putting a highly efficient secondary power source on board to help charge the batteries and produce electricity for times when the batteries are not sufficient. This provides flexible choices for the secondary power source, from gasoline engines, E85 powered engines, or even fuel cells. With the secondary source, you get the ability to drive 40 miles on pure electricity while not having to worry that, if something unforeseen comes up, you might not be able to complete your trip and make it home (a major limitation of previous electric vehicles). Given the optimized size of the secondary power source, you should see fuel economy numbers of at least 50-60mpg while seeing many owners never having to fuel the vehicle for months at a time and effective mileage in the hundreds of miles per gallon. And, unlike most previous electric vehicles, a Volt would have the utility and range of a conventional car (and the ability to refuel to extend your trip) - while giving you extreme fuel savings in your average day-to-day driving. While this system has created quite a buzz, most (myself included) have been somewhat cautious about warnings from GM that battery technology might not allow the concept to come to market for some time. Now, Automotive News (via Leftlane News) has reported that GM has officially green-lighted Volt for production. It will be an off-shoot of the Delta II chassis that will also serve as the basis for the next Chevy Cobalt as well as the next Saturn Astra (not the model that comes to market this fall). Also of interest is that GM expects to make the production Volt available in 2010 and will offer a choice of either a gasoline or fuel cell secondary power source. I'll be keeping a very close eye on this one and might consider it as one of my choices for my daily driver (while keeping a nice sports car on the side for my enthusiast 'needs'). Leftlane News: Shocking! Volt Production by 2010? To me, the future seems a bit right around the corner :) What I mean is the vision is having automobiles transition into an electric powered motor on most of the cars on planet seems quite plausible and really feasible in the near future. But, then again we have So many cars on the road as it already is these days, what will we do with every other Gas powered vehicle? Dispose of it? Use its parts? What is there to do with it? Also, my personal question that I've been asking myself is don't we want this movement to take place a.s.a.p. since it will sincerely help our environment or is it simply a matter of Gas companies paying for the electric powered motor to delay its expansion to the automotive industry since the electric alternative is by far greater than our expensive non-eco friendly gasoline.